Whether the final success of trans-oceanic flying lies in the development of huge flying boats such as the China Clipper, or in some radically different type of boat is a question no truly progressive engineer would care to answer. This much they will sayâ€”that speeds of 500 miles an hour or more must be regarded as commonplace. 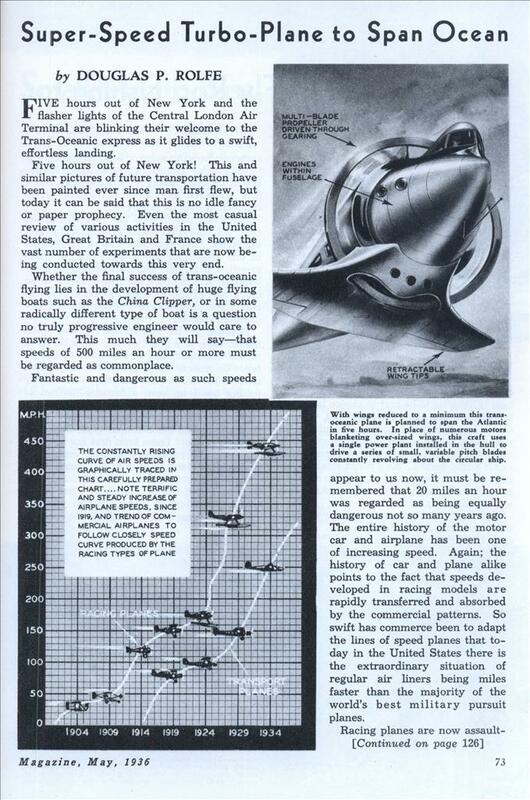 Fantastic and dangerous as such speeds appear to us now, it must be remembered that 20 miles an hour was regarded as being equally dangerous not so many years ago. The entire history of the motor car and airplane has been one of increasing speed. Again; the history of car and plane alike points to the fact that speeds developed in racing models are rapidly transferred and absorbed by the commercial patterns. So swift has commerce been to adapt the lines of speed planes that today in the United States there is the extraordinary situation of regular air liners being miles faster than the majority of the world’s best military pursuit planes. Racing planes are now assaulting the 500 miles per hour mark. It is reasonably certain that the time is not far off when purely commercial planes will be equaling if not actually surpassing this figure. That speeds like this will be attained with the conventional plane of today with it’s numerous power plants strung like beads along the large-spanned wings is dubious. What is more likely and probable is the gradual improvement of wing sections (which is constantly in process) attaining a point whereby it will be possible to dispense with a great deal of the area now essential to safe flight. Then; what today forms the predominant portion of a plane may well become a mere rudimentary member with, possibly, extensible surfaces for landing and other maneuvers which involve reduced speed. 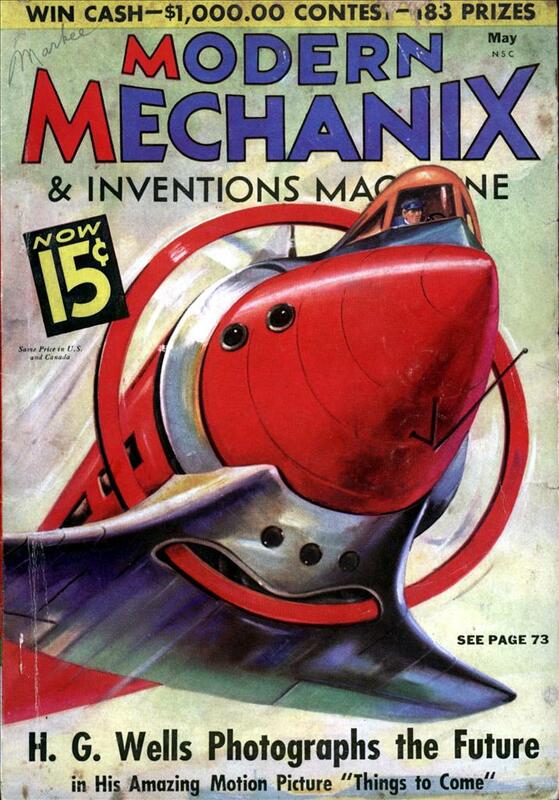 As a matter of plain fact the whole tendency of wing design today is directed towards this goal as pictured on the cover. To bring New York within five hours of London would mean a facility almost beyond our imagination. Other complications, such as the continual threat in times of war to countries erstwhile virtually isolated, would attain fantastic proportions. Remove the wings and put a shroud around it, and you’ve got a turbo-prop engine — albeit a HUGE one. I like that they specifically refer to their “carefully prepared chart”. In fact we went all the way down to the five and dime to get a new package of graph paper for this one! Nope, no fooling around with plain paper and t-squares here. This is a good line too; “To bring New York within five hours of London would mean a facility almost beyond our imagination”.